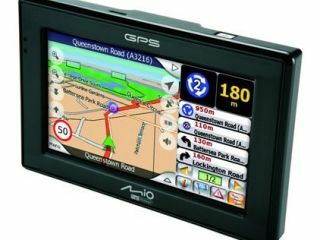 Mio Technology is showing off four new satnav devices at the CeBIT show in Hannover today. The ultra-slim Mio C320, Mio C520, and Mio C520t all feature large 4.3-inch widescreen displays, which can also show surroundings and commands in split screen view. The Mio C220 has a smaller 3.5-inch screen. All four sport the latest version of the TeleAtlas mapping software, as well as Mio's MioMapv3 which includes details such as time and distance to destination, traffic flow updates, and selected points of interest in the local area. They also provide speed camera alerts, a 20-channel SiRFstarIII GPS receiver and a newly designed 'click-in' docking station. Speed camera updates can be downloaded free to the devices from Mio's website, as well as personal camera locations, which can be shared with other Mio users via the website. The units feature maps of 22 European countries preloaded on the supplied 1GB flash memory card. Mio could not confirm UK prices yet but the EU prices are as follows: the Mio C220 costs 199 euros, the Mio C320 is priced at 349 euros, the Mio C520 costs 399 euros, whilst the Mio C520t is priced at 449 euros.